Being a resident of south Louisiana, I sadly live in a world deprived of one of my favorite fast-food treats, the White Castle Slider. While I was on my job interview a few days ago I was delighted to discover that right next door to the hotel I was staying at there was a shiny brand-new White Castle. I felt like I had stumbled into the realm of a lost but much more advanced civilization, that just happens to make small hamburgers. This must have been like what Howard Carter felt when he found Tutankhamen's tomb. As soon as I checked in I hot-footed it over and ordered a sack of sliders, and no fries, since they are just empty filler. I managed 8 before I had to stop and they were exquisite. My only regret was that I couldn’t share the experience with Ann. She's an even larger White Castle fanatic than I am. In fact those little sliders rank among her most favorite things ever. The thought of her missing out on something she loved led me to explore several ideas after my interview on how to transport a bunch of sliders back to Baton Rouge. Sadly, none were workable. Almost every idea I could think of ended with botulism and a emergency trip back to MDA. However, I did hit on a plan, which I put into action yesterday. While I couldn’t bring Ann to the sliders or the sliders to Ann, I could make my own for her. And after a quick trip to Wal-mart and a little research on White Castle via Youtube, I had everything I needed to crank out two dozen of the tiny but tasty little burgers. I know they aren't the "real thing", but I love her so much I wanted to get as close as possible. Sadly the operation was too large for it to be a surprise, but Ann was over the moon about them. She gobbled 4 at dinner and another 2 for breakfast this morning. So I think she likes them. Still no word about the results from the job interview. Never fear, if it doesn’t work out I have a couple of irons in the fire still. My niece, with whom I'm living, just got the official word that she has pink eye. Insert paranoid scream here. According to the doctor she'll be contagious for the next two days. This means that we'll be isolated from each other for the next few days. I can find humor in this since we just had a lengthy conversation with each other from the relative safety of our rooms. Imagine the two of us yelling across the house to each other. The neighbors must think we're insane. I've sent an email to my transplant nurse to see what further precautions the team wants me to take, if any. On the cat front, there appears to be a lack of squiggly little parasites, so I'm going to assume that the shots worked. I'm currently working on a knitting project for myself and it's making me feel like Sisyphus. The whole project should have taken less than a week and yet it keeps dragging on due to mistakes on my part. I keep getting to the same point and having to rip back an inch almost daily. This morning I was feeling pretty smug about being almost done when I noticed a dropped stitch that was slowly unraveling down the side of the hat. Now I have to fix it. Grrrrr. At least I'll have something to do while I'm on lock down. After one missed flight, a mechanical problem with the plane, and some lost luggage, Chris is back safe and sound. He's currently ensconced on the couch watching Sponge Bob and fending off Etsuko who has worms. That's right, she has worms. I made the discovery yesterday while home alone and thought, "Of all the times for something like this to happen." I know how the worms are transmitted, so I knew the likelihood of me contracting them was low, but nonetheless. I have the unfortunate distinction of being the slowest moving thing in the house, so you can usually find either Pez or Etsuko draped over me or in my lap. The cats in my lap, I don't mind. The cats plus their wiggly little passengers, I do. Chris, Dixie and I brought the two girls to the vet this morning to take care of business. I stayed out in the car just to be safe. The vet assured Chris that the cats should be worm free in 24 hours. I've recently realized that I haven't been writing about some of the side effects that I've been experiencing since this last transplant. I suppose that they've become so ingrained into my daily life that I take them for granted. Some days, my hands shake uncontrollably. It gets to the point that I can't write legibly or hold knitting needles. Most days, it's just a fine tremor. If I try to hold my hands still, I can feel the muscles in my shoulders begin to shake as well. It's a surreal feeling not being able to control your fine motor skills. My transplant doctor says it's a combination of Prograf and steroids. For the most part, I find the side effects funny in a ha-ha sort of way. 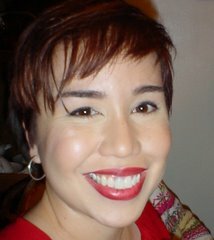 My face, neck, and abdomen are puffy from the steroids and to be absolutely honest, it doesn't bother me. I know it's not permanent and will go away once the steroids stop. I've also run into a little steroid induced acne which I don't love. I feel like I've already been through that phase in my life. The do over isn't so bad, but who really likes to deal with a pimple. My most favorite side effect of this medication is the luxurious hair growth. 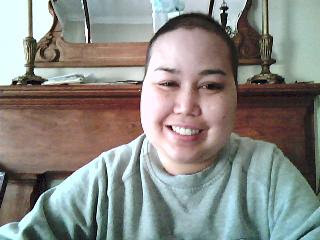 The hair on top of my head is coming in much more quickly than it did with the last transplant. I almost have a head full of quarter inch long hair. Unfortunately, the luxurious hair growth doesn't stop on my head. I've developed quite the man-stache and I suspect that my sideburns/beard will be the envy of many a twelve year old boy. I am not exaggerating and know that there are others of you out there who are experiencing the same thing. Chris was calling me "Fuzzy P" for a short period of time. It was that bad. Past tense since I got my hands on some cold wax strips. With all of that being said, I know I have it easy. I'm doing well and staying out of the hospital. Chris just got back from his job interview and maybe something good will come of that. Since I promised to reveal all, it was in Kentucky. I took another step toward normal today when I dropped Chris off at the airport. Of course I couldn't go in with him, but I felt well enough to drive there and back which is a small victory. I won't say where Chris flew off to, but will say that it was for a job interview. He comes back tomorrow night and I know he'll be exhausted with all of the flying and driving that he'll have to pack into two days. While he's away, I've promised to stay out of trouble. No running with scissors or licking door knobs for fun. This is the longest that we've been away from each other since this entire cancer saga began and I know it's hard for him not to be able to "see" that I'm well. I'll do my level best not to instigate an internal coup against my graft while he's gone. I'm staying hydrated and taking my temperature at intervals. I've done all that I plan on doing of significance today, so he can rest assured that I'll be taking it easy. He's left me in good hands with Dixie. She's already checked in. Pez and Etsuko are keeping me company while studiously pretending the other doesn't exist. Just another lazy day around the Gregory household. As an aside, can you believe how puffy the steroids have made my face? I was up at 3am with another episode of knee pain. I'd had a little accident earlier in the day that caused the knee to get compressed. The accident involved someone sitting on my bent leg a little forcefully. In their defense, it was a legitimate accident. I managed to get an ice pack on it and after a few hours was able to go back to sleep. Today, it feels like preschoolers have used my leg like a pinata. I'll also confess to feeling the cumulative effects of too little sleep. I've been staying up past my normal bedtime the last few nights and sleeping too few hours during the night. I'd hoped to remedy the situation last night by going to be early, but you know how that turned out. I had a few projects planned for today, but in light of how my knee is feeling, I think I'll have to take a pass. For those of you who don't know, our pals at Microsoft have released a new program called Songsmith. It allows the user to "sing", and I use that word lightly, lyrics to his/her computer, which while running the program will "construct" music around them. In effect it's sort of a reverse karaoke. When the slide whistle went off at 1:59 Ann and I nearly choked to death. It seems that Dr. Clayton Forrester is heading up Microsoft Research now. We just got back from a visit to my local oncologist and I can report that my numbers are fine. My white blood cell and absolute neutrophil counts are elevated but that's still due to the steroids. It was really nice to see Jennifer and Dr. Bienvenu again after so many months away. As usual, the waiting room was packed and I was odd man out wearing a surgical mask. It still amazes me that there are people in there actively undergoing chemo and not taking precautions. Do their doctors not warn them or do they choose to ignore the advice? I managed to finish the beret that I was knitting for a friend's little one. I even blocked it so that it looked less like a smurf cap and more like a beret. Pictures will be forthcoming after I mail it off and have comfirmation that it's been received. There were one or two episodes with my knees last week, but they were so minor, I didn't think that they bore noting. Besides, I brought it on myself by staying on my feet for too long. Chris is in charge of dinner tonight, so I plan on taking a small nap and expending the minimum amount of energy required of me today. 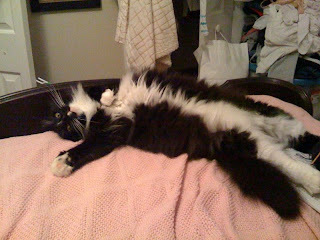 Wednesday evening Dixie noticed that our cat Jay's breathing was a little labored. He wasn't displaying any other signs of illness and had a healthy appetite, so we decided to see what happened the next day. On Thursday when his breathing didn't improve, we made an appointment with a vet. We learned that he had a tumor in or next to his heart that was eating up his blood supply and causing his lungs to fill with fluid. The vet explained that because of the position of the tumor and the amount of fluid in Jay's lungs, there was nothing to be done. She went on to explain that although he was hiding it, Jay was suffering terribly. We miss both Squeeze and Jay terribly and want to thank everyone for their kind words. I awoke a few minutes before 2am with excruciating pain in both knees. I had a small episode the night before last, so I wasn't surprised by this incident. It didn't help that I stayed on my feet most of the day, so that by the end of the night my left knee felt a little twitchy. My own fault, really. I hobbled out to the kitchen and got the ice packs, but for some reason the weight of them on my knees made the pain worse. That's never really happened before. To put things in perspective, the weight of the blanket on my prone knees stressed them. I bit the bullet and left the ice packs on, but switched over to a lighter blanket. This was torture since the temperature had finally dropped to something resembling winter and I was deliberately applying ice to my legs. I'm one of those people who doesn't like to be cold while sleeping. Queen weenie, that's me. This morning, it feels like my knees are grinding, so I've resolved to stay off my feet as much as possible. I did forget to mention that we discussed these intermittent episodes with my transplant doctor last week and she's under the impression that my knees are over-stressed and compensating for the fact that I've lost muscle mass from the steroids. She's suggested that I start doing low impact exercises to strengthen my thigh muscles and glutes. I'll add it to my list of things to do. Overall, I feel really well and have no other complaints. The knees aren't so bad in the big scheme of things. The last few days have been trying. 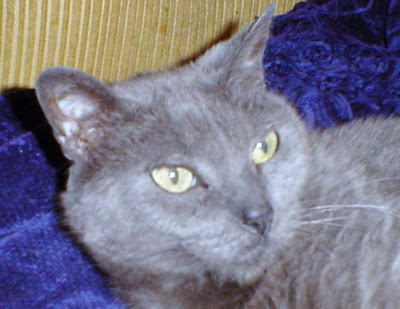 One of the cats became very ill over the weekend and had to be euthanized on Monday. The vet estimated that she was between 17 and 22 years old and Chris and I knew the day was coming, but I don't think you can ever really be ready for something like that. 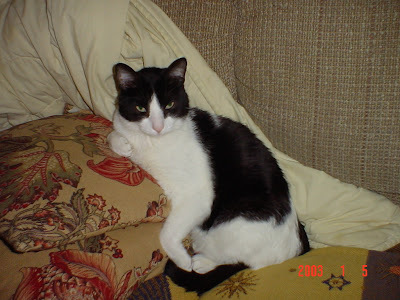 We had 14 great years with Squeeze and we'll miss her very much. 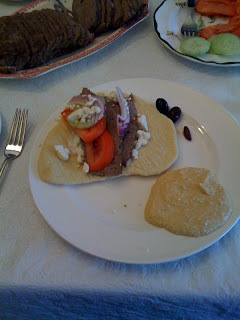 Here's a link to the gyro recipe. I'd increase the spice measurements by one teaspoon each and since I like garlic, I'd double the amount of garlic. 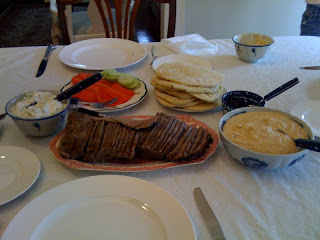 We managed to make the pitas today and in honor of them, Chris made gyros. I awoke sometime before dawn to the sound of the neighbor's great danes barking and whining across the street. I listened to them for a few minutes before I realized that they weren't the reason for my wakefulness. There was something rattling around in my head trying to work its way up from the crevices of my memory and until it did, I knew there would be no more sleep. By the time the sun started to come up I realized it was January 9. It's the two year anniversary of my diagnosis. I must have made the unconscious decision not to attach any significance to the thought, because I promptly fell asleep and slept until 8. The rest of the day was spent knitting and puttering around the kitchen. Chris and I had a date to make pita, but it somehow never happened. It will keep until tomorrow. Maybe being able to say something like that is the most important thing that I will take from today. Here is a picture of the steamed dumplings we made this weekend. I wish I had a clever story or pretend that they are some sort of thematic device, but in truth they're just dumplings. Enjoy. Combine all of the ingredients and mix well to incorporate. Chill for at least an hour before serving. The corn will become sweeter the more it marinates in the lime/olive oil dressing. Sometimes I use half a red onion instead of the green onions for a slightly different taste. Chris doesn't like raw tomatoes, so depending on how generously I'm feeling towards him, I usually leave it out. When the stray tomato makes it into his grocery cart, I'll gleefully toss it in to the salad. If you like a little heat, add a finely diced jalapeno, minus the seeds. This is a recipe that I've adapted and modified over time. Cream splenda or sugar with cream cheese in mixer at medium speed until fluffy. With mixer on low, slowly incorporate cream. Once cream is fully mixed in, adjust speed to medium and mix for at least a minute. In a small bowl, mix water and vanilla. Microwave on high for a minute. Sprinkle gelatin over top and allow to bloom. After about 3 minutes, mix gelatin into liquid with fork. Be sure that it dissolves completely, or you'll have gummy strings in your cheesecake. Melt chocolate. I do it in a microwave set at 80% power. Just do it in 30 second intervals, being sure to stir each time. Don't over do it, or you're chocolate will scorch and be ruined. If this makes you nervous, just do it the traditional way with a double boiler. With the mixer on low, slowly incorporate the gelatin mixture into the cream cheese mixture. Once this is thoroughly mixed in, add the melted chocolate and mix until completely blended. Smooth mixture into an 8 or 9 inch spring form pan and refrigerate for at least 4 hours. Run a knife around the edges when you're ready to release it from the pan. Enjoy! I don't make a crust because I'm under the impression that I'm "saving" calories by skipping it. You could do a graham cracker or chocolate cookie crust if you feel that you need it. You could also omit the chocolate and vanilla and substitute 2 TBS of lemon juice, amaretto, rum, or your cordial of choice for a different flavor. It's a very forgiving recipe. You could also probably use white chocolate instead of milk or semi-sweet. For Lisa: Thankfully, I'm off the neutropenic diet, but I still have restrictions like no sushi, oysters, alcohol, medium-rare meats. I had hoped to post last night when we got back, but there were several traffic delays, so we didn't get back in until after midnight. My bloodwork came back clean. My phosphorous, potassium, and LDH were all high, but my doctor thinks that the sample was hemolyzed, so she wants more blood work in two weeks. I have orders written so that I can go to my local doctor to have it done, instead of traveling to Houston. I have to confess that since that one suspect CBC on which a blast appeared, I've been on tenterhooks. Every little muscle twinge or knee ache was suspect. My mind kept stuttering over the fact that a single technician saw what they thought was cancer those few weeks ago. I kept having those conversations with myself about going to extremes and worrying about nothing. It's just that with blood cancer, your relapse symptoms could be anything. I had a persistent cough and low grade fever. My local doctor didn't think much of it. Surprise. Over the last two weeks I did my best not to dwell on the chances of relapse. I didn't rush to the internet to research options or study published papers. I occupied myself with mundane things to the point of the ridiculous. I baked huge loaves of bread and would plan an entire day around making dinner. I found the prep work of washing and chopping vegetables soothing. It was something that I hadn't been able to comfortably do while in our apartment in Houston. Being able to feed other people gave me a focus. I made cheesecakes and pitas. I've bookmarked several recipes and created menus. It became something of a small mania. When Cathy handed me a copy of my bloodwork, I found that I couldn't really focus on it. I skimmed it a few times without really reading it. I finally noticed that my ANC was high, so I made myself look for that dreaded word. It wasn't there. I should have been relieved, but I think that I've been holding myself in so tightly for the last two weeks that I forgot how to handle things. I kept thinking of Ronni Gordon. She's had multiple transplants as well and recently relapsed. I check on her blog daily anxiously awaiting news of the next step in treatment or how she's feeling or what she's up to. I get angry that she continues to have to deal with this. While waiting for our stemcell appointment, we met a couple that we'd been following since I was first diagnosed. Chris and I kept hoping to run in to them since we knew that Betsy and Dean were often in Houston on the same days that we were. We'd make a game of trying to spot them in the waiting rooms. Dean is two years out from transplant and dealing with GvHD. He's such a positive person and was such a pleasure to meet. His wife Betsy is an absolute pillar. She's got such a radiance and strength that you can't help but remark on it. We got to compare notes and trade war stories. Most importantly, we got to make new friends. I know this post has been a bit scattershot, but I felt like I had a few things to own up to. After a solid night's sleep, I feel like myself again. The stutter is gone. I don't feel compelled to rush into the kitchen to put together some elaborate creation, although I've promised myself that I will stick to the menu that I've created for the next week. In case you're wondering, it's chicken quesadillas with corn and black bean salad night. I made my first apple pie the other day for New Years dinner. All credit for the recipe has to go to Alton Brown of Good Eats, but I was still surprised at how easy it was to pull off and especially with the final results. I didn’t think it was possible for a novice to make something as impressive and frankly delicious as this was. If you want the recipe check it out here (part 1) and here (part 2). Sorry if it seems out of place to talk about "apple pie" on a medical blog, but there hasn’t been much interesting going on. No temperature spikes, no infections...no nothing. Ann has the occasional bout of knee pain in the middle of the night, but those episodes are infrequent and easily controlled with an ice pack. Apart from a slight increase in the size of the gvhd spot on her leg there is nothing else of note to report, and that could be due to her tapering her steroids recently. Next Monday we are back at MDA for our first check up after being released, and hopefully there wont be anything interesting to talk about then either.